Canoe Ridge Creations: i heart handmade. growing up in a crafty and creative family, having a handmade christmas is pretty much the norm. we sew quilts. knit up pretty things. bake yummy goodies. one year we even brewed our own beer (yummy!). and through the years, i truly believe it has made us appreciate the holiday season a whole lot more. understanding the hard work and thought that goes into a handmade gift is so much more valuable than a whole sled full of material things. i just love handmade. so when i found this fun little handmade bow tutorial using magazine pages i had to get my hands dirty in crafty goodness. it's the perfect icing on a handmade gift--or any gift for that matter. rather than use the magazine pages like the tutorial suggests, i just used a couple pages from an old newspaper. 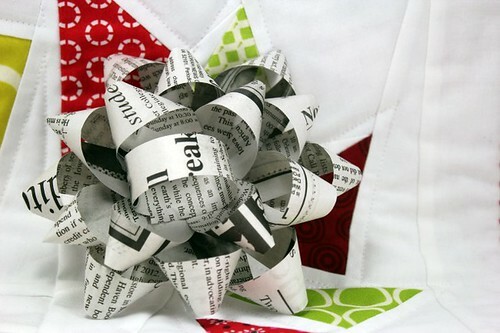 i love the look of the newspaper text ribbons! do you love handmade? 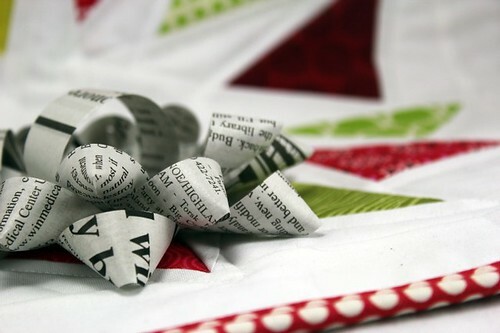 what types of handmade gifts will you be giving this holiday season? Pillow covers. Beautiful tradition your family has! I'm with you...handmade is best. Just finished up a pillow for my niece. She loves penguins and plays Club Penguin on-line. I made a penguin block into a pillow with a small pocket on the back to hold her Club penguin card. These are really sweet! I'm the worst gift wrapper. I'm feeling pretty good about my handmade gifts this year--3 quilts, 2 pouches, a scarf, a little embroidery, lots of ornaments, a journal cover. I can't wait to start giving it away! I love these! I am giving lots of handmade gifts this year -- pillows, stockings, dolls, pj's. I can't wait! 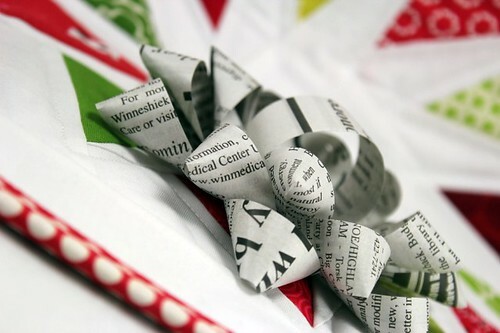 How cool, thanks for the link, may be the perfect way to use up some mounds of scrapbook paper! All my family gifts are handmade, and in fact most of my friends' ones too, they've come to expect it! Your bows are beautiful and very creative! Perfection! BEAUTIFUL bows!!!!! Thanks so much for the linky!!!! I can give my sweet Katy something to do ,other than animal crossing ( although she has a Singer treadle there), when school is out!!!!!! Love that handmade bow! I am desperately trying to finish a dress for each of my nieces. Ugh. Nothing like being down to the wire. It is a wonderful bow and those picture are wonderful. Hi Megan! That's beautiful and I love to use pages with letters! Last year I made a small tree from a magazine and some small balls and hearts. That looks so pretty Megan!